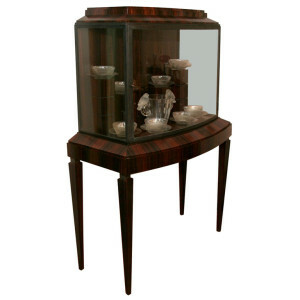 A French Art Deco cabinet By Andre Sornay, circa 1920-1925, in ebony macassar and oak, with walnut root marquetry. 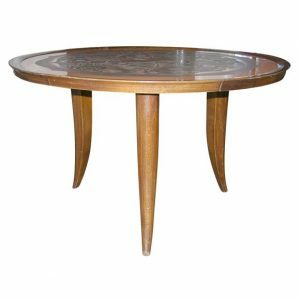 A French Art Deco low round table created late 1930’s by Jallot and Marx, with a beautiful sand blasted glass top decorated with stylized rabitt amongst flower heads and folliage. Beautiful Art Deco Illuminated Vitrine / Display Cabinet from 1950’s in ebony macassar, with modular interior supports and 2 glass shelves, perfect for collection displaying. Pair is available. 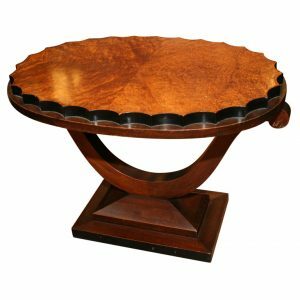 An American Art Deco side table by Dynamique Creations, in mahogany and birds eye burl walnut veneer, from circa 1920’s. 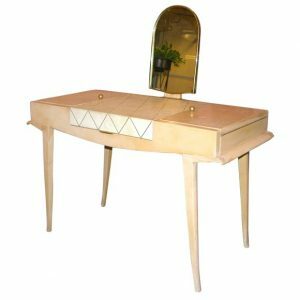 Art Deco furniture is comprised of beautifully crafted pieces influenced by geometric patterns, strong colors and bold, precise lines. 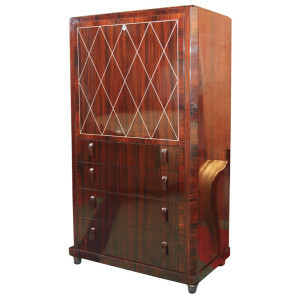 The impeccable detail of the very finest Art Deco furniture includes rich materials and often inlays of ivory, mother of pearl, tortoise shell and even shagreen. 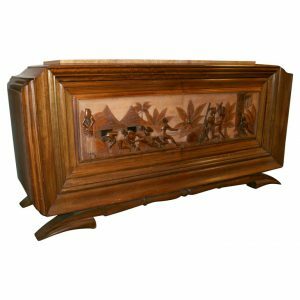 Intricately carved woodwork and handcrafted pieces make furniture from the time period (1925 - 1935) highly valuable not just for its stunning appearance but for its value to collectors as well. 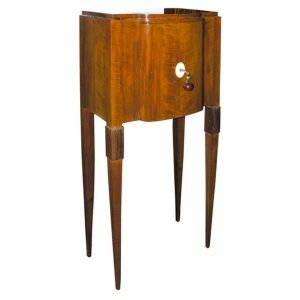 We carry a variety of beautiful Art Deco furniture for sale, including: armchairs, occasional tables, mirrors, consoles, jewelry cabinets, side tables, dining chairs, lounge chairs, fireside chairs, sideboards, coffee tables, screens, buffets and cabinets. 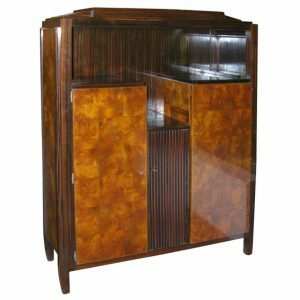 We also carry hard to find furniture pieces including: secretaires, chiffoniers, bar cabinets, smoking tables, commodes and vitrines. See all Art Deco Furniture for sale. Art Deco takes it name from the 1925 Paris Exposition Internationale des Arts Décoratifs Industriels Modernes (the International Exposition of Modern Industrial and Decorative Arts) and became the first truly international style. The opulence and overall optimism of the Post WWI era fueled the movement which went well beyond furniture and left its mark on interior design, advertising, fashion and especially architecture. 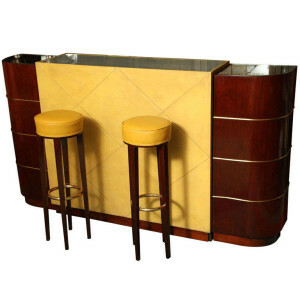 The glossy and sleek look Art Deco furniture is known for is a modern look celebrated to this very day. 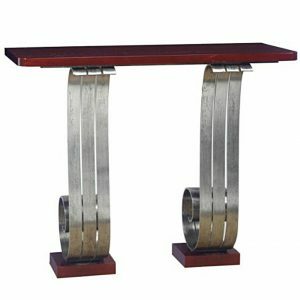 A hallmark of Art Deco style is the creative and abundant use of different mediums. Because of various factors coming together like improvements in the steelmaking industry and invent of the plastics industry, designers incorporated diverse materials in their designs. 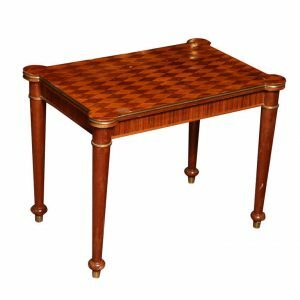 From exotic woods like mahogany, teak and ebony to iridescent glass, marble, metalwork, gems and animal skin - the rich use of material made for a vast diversity in design. 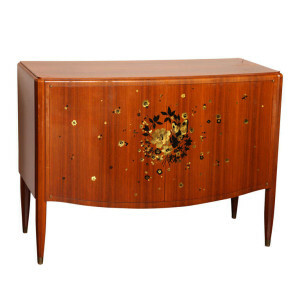 Intricate inlays and silk pompoms adorning the handles of cabinet drawers are just two examples of the exquisite detail in Art deco furniture. This style applies not only to large furniture pieces like tables, chairs and desks but also lighting. 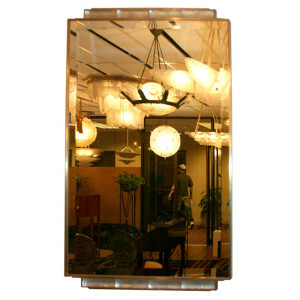 Lamps, wall sconces and chandeliers are all very popular pieces of the era. Floor lamps and table lamps each have their own exquisite detail, making it possible for Art Deco furniture for sale here on our website to be beautifully complemented with the lighting of your choice. 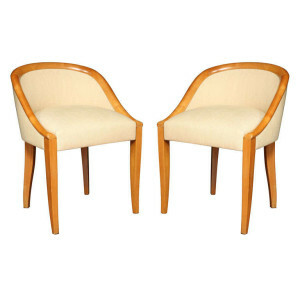 We are proud to be your source for unique furniture pieces like secretaires, chiffoniers and Art Deco lounge chairs. 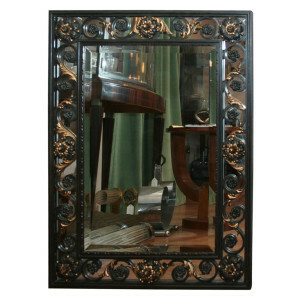 This impeccable detail is what we seek today in Art Deco furniture for sale on our website. Whether you are looking for a piece of furniture for your entryway or your living room we have furniture that will stand out in any room. 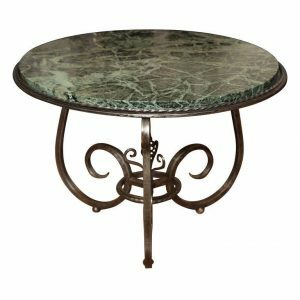 The prominent lines and the brilliant motifs common in Art Deco make admirers fall in love with pieces that seem to evoke a special time and place.